Welcome to edition fifty six of Insider Weekends. Insider buying dropped sharply with insiders purchasing $10.64 million of their stock last week when compared to $69.72 million in the week prior. Selling on the other hand increased with insiders selling $758.59 million worth of stock compared to $550.9 million in the week prior. The insider Sell/Buy ratio is calculated by dividing the total insider sales in a given week by total insider purchases that week. The adjusted ratio for last week went up to 71.29. In other words, insiders sold more than 71 times as much stock as they purchased. 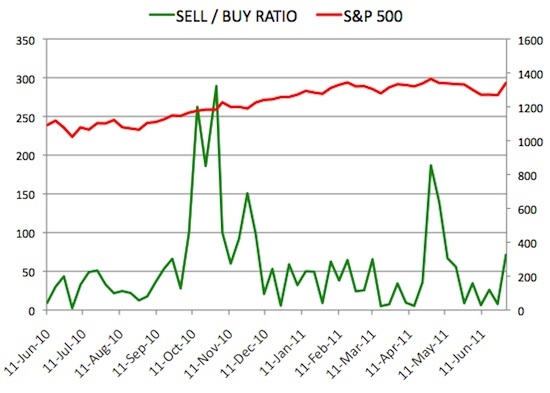 The Sell/Buy ratio this week compares unfavorably with the week prior when the ratio stood at 7.9. We are calculating an adjusted ratio by removing transactions by funds and companies and trying as best as possible only to retain information about insiders and 10% owners who are not funds or companies. Note: As mentioned in the first post in this series Introduction to Insider Weekends, certain industries have their preferred metrics such as same store sales for retailers, funds from operations (FFO) for REITs and revenue per available room (RevPAR) for hotels that provide a better basis for comparison than simple valuation metrics. However metrics like Price/Earnings, Price/Sales and Enterprise Value/EBITDA included below should provide a good starting point for analyzing the majority of stocks. Director Eugenio Clariond acquired 15,000 shares, paying $54.02 per share for a total amount of $810,320. These shares were purchased indirectly by a trust. Director Steven J. Klinger acquired 2,000 shares, paying $54.35 per share for a total amount of $108,700. Mr. Klinger increased his stake by 85.43% to 4,341 shares with this purchase. Director David D. Harrison acquired 1,000 shares, paying $54.51 per share for a total amount of $54,510. Mr. Harrison increased his stake by 42.86% to 3,333 shares with this purchase. Voluntary Disclosure: I have a long position in Navistar. Director Mark Slezak acquired 385,000 shares, paying $1.63 per share for a total amount of $628,741. Mr. Slezak increased his stake by 1582.80% to 409,324 shares with this purchase. President and CEO William P. Moffitt acquired 20,000 shares, paying $1.58 per share for a total amount of $31,642. Mr. Moffitt increased his stake by 4.34% to 480,909 shares with this purchase. These insider purchases follow a steep drop in the stock price last Tuesday on heavy volume after the FDA requested additional data about its Plavix Metabolism diagnostic test. Insider buying by multiple insiders following a sell-off has often resulted in a short-term upward move in the stock. However I would advise caution with Nanosphere as the company has already rebounded off its 52 week low set last Thursday and continues to lose money. The company had $30 million in cash on its balance sheet as of March 2011 and raised an additional $32 million in a secondary offering priced at $2.20 in May. You can view the list of recent insider transactions for Nanosphere, Inc. here. President and COO Willing L. Biddle acquired 19,500 shares of this commercial REIT, paying $17.05 per share for a total amount of $332,475. These shares were purchased indirectly by a trust. You can view the list of recent insider transactions for Urstadt Biddle Properties Inc. here. Chief Executive Officer William Paul Livek acquired 6,000 shares, paying $17.67 per share for a total amount of $106,030. Mr. Livek increased his stake by 6.16% to 103,384 shares with this purchase. Chief Operating Officer & CFO David I. Chemerow acquired 5,500 shares, paying $17.86 per share for a total amount of $98,213. Mr. Chemerow increased his stake by 11.10% to 55,035 shares with this purchase. This Portland, Oregon based company has been transitioning its business model from tracking the sales of DVDs to tracking viewership of Video On Demand products and Box Office data. While its new division is growing rapidly (30% year-over-year growth in Q4), the old “home entertainment” tracking business still represented 65% of overall revenue of $97.1 million in fiscal Q4 ended March 2011. The company posted disappointing earnings over the last two quarters and the numbers look terrible for this company. On the positive side, the company managed to generate positive free cash flow last fiscal year despite a net loss and has $26.3 million in net cash and investments on its balance sheet to help it navigate its way around this transition phase. The company also announced a $5 million share buyback when it announced full year fiscal 2011 results earlier this month. You can view the list of recent insider transactions for Rentrak Corporation here. President and CEO Stephen E. Macadam acquired 2,250 shares of this industrial products manufacturer, paying $44.73 per share for a total amount of $100,644. Mr. Macadam increased his stake by 2.75% to 84,215 shares with this purchase. It is not often that you come across an insider purchasing the stock of a company that is close to its 52 week high and also happens to be reasonably valued. With a forward P/E of 10.07 and selling at a little over one time sales, EnPro is worth exploring further. You can view the list of recent insider transactions for EnPro Industries, Inc. here. Chairman of the Board Maurice Marciano sold 541,571 shares for $42.09, generating $22.8 million from the sale. These shares were sold indirectly by a trust. Vice Chairman & CEO Paul Marciano sold 200,000 shares for $41.75, generating $8.4 million from the sale. These shares were sold indirectly by a trust. You can view the list of recent insider transactions for Guess? Inc. here. Director Craig Ramsey sold 90,000 shares for $147.11, generating $13.2 million from the sale. Director Lawrence Tomlinson sold 9,900 shares for $150.00, generating $1.5 million from the sale. These shares were sold as a result of exercising options immediately prior to the sale. EVP, Platform and Marketing George Hu sold 4,582 shares for $147.37, generating $675,249 from the sale. These shares were sold as a result of exercising options immediately prior to the sale. President, Wordwide Sales and Services Veenendaal Frank Van sold 3,071 shares for $147.31, generating $452,395 from the sale. Chief Financial Officer Graham Smith sold 2,500 shares for $147.37, generating $368,425 from the sale. These shares were sold as a result of exercising options immediately prior to the sale. Director Craig Conway sold 750 shares for $149.62, generating $112,215 from the sale. EVP, Worldwide Sales Hilarie A. Koplow sold 500 shares for $147.12, generating $73,560 from the sale. These shares were sold as a result of exercising options immediately prior to the sale. You can view the list of recent insider transactions for Salesforce.com here. Voluntary Disclosure: I have a short position in Salesforce.com through put options. Chief Executive Officer Jeffrey C. Sprecher sold 56,628 shares for $124.49, generating $7.05 million from the sale. 10,624 of these shares were sold as a result of exercising options immediately prior to the sale. Director Frederic V. Salerno sold 4,167 shares for $125.00, generating $520,875 from the sale. These shares were sold as a result of exercising options immediately prior to the sale. President & Chief Operating Officer Charles A. Vice sold 3,600 shares for $125.13, generating $450,456 from the sale. You can view the list of recent insider transactions for IntercontinentalExchange, Inc. here. Director Robert B. Millard sold 150,000 shares for $42.63, generating $6.4 million from the sale. VP- Human Resources David E. Darling sold 2,200 shares for $44.06, generating $96,934 from the sale. You can view the list of recent insider transactions for Gulfmark Offshore, Inc. here. Senior Group President Richard E. Riegel sold 200,000 shares of this RV manufacturer for $28.37, generating $5.7 million from the sale. These shares were sold indirectly by Mr Riegel’s wife. You can view the list of recent insider transactions for Thor Industries Inc. here.